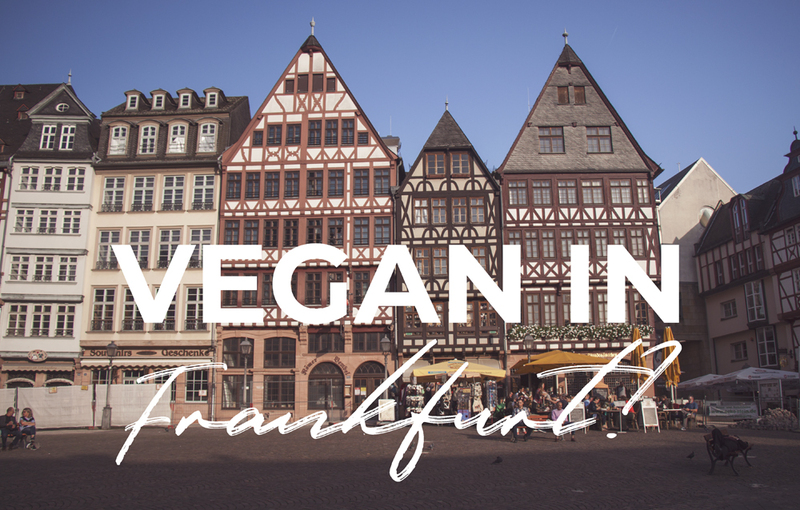 As part of the Two Vegans One Country project, Randi and I stopped in Frankfurt to sample what vegan food the city had to offer last October. Turns out, there was quite a lot and we ended up running out of time to sample everything. 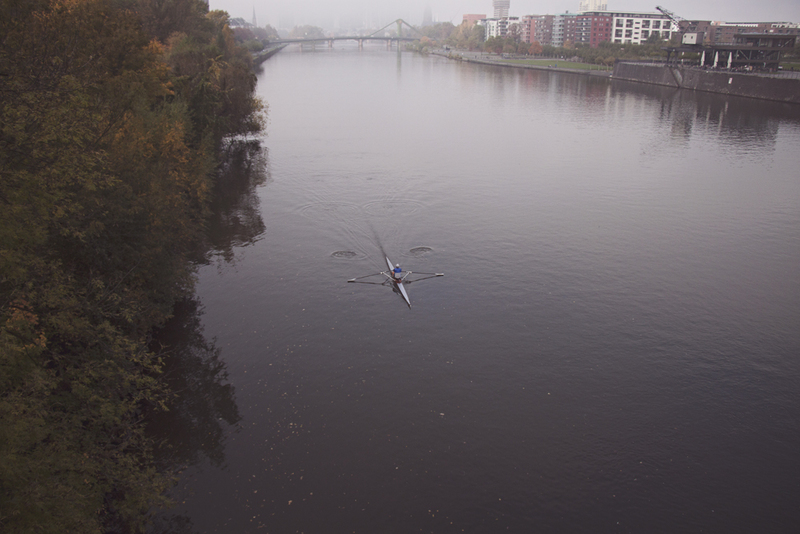 Please let me know in the comments below what I should add to the list and try next time I travel to Frankfurt! BOOK YOUR ROOM AT 25HOURS THE GOLDMAN NOW! 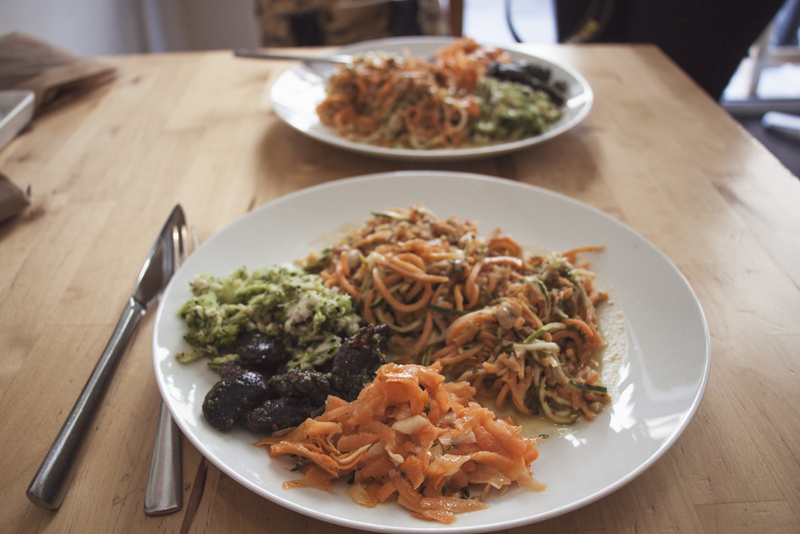 A nicely-designed, homey spot in a quiet area of the city center, Beet Root serves home-style vegetarian cooking, and a lot of it is also vegan. There are a few daily specials such as soups, stews, and salads to pick from and create your own plate. There are also a some homemade vegan sweets (cakes or cookies) at all time. Yay! 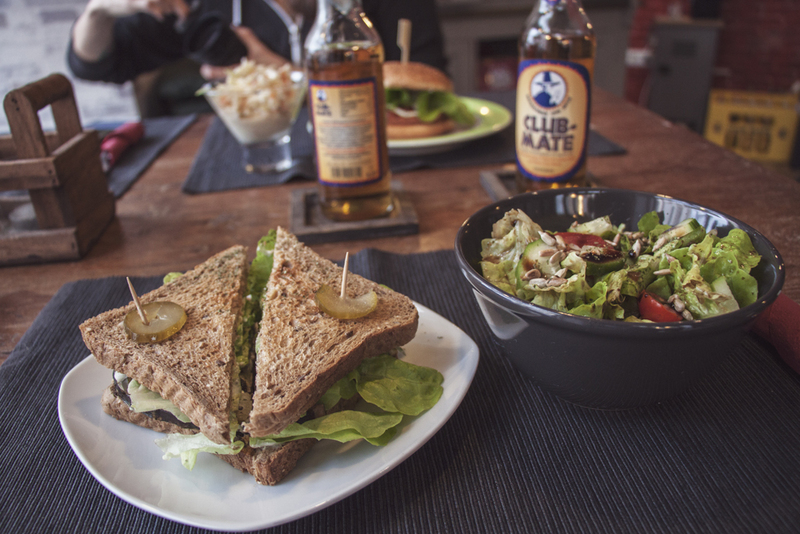 Savory is an all-vegan café tucked away in a quiet residential neighborhood and it was our first pitstop in Frankfurt. I loved it! Friendly staff, good wifi, unpretentious menu, comfy and funky interior and a big selection of cakes and sweets. Everything is homemade and on the fast food-y side of things, with things such as hot dogs, hamburgers, and cupcakes. There are also some healthier things, like sandwiches and salads. It’s a short menu, but with a little something-something for everyone. Cafe Metropol is huge and also hugely popular, especially at the weekend for their amazing brunch. They have a broad selection of vegetarian and vegan dishes at all time. But if you so happen to be in Frankfurt on Saturday or Sunday, I highly recommend you come here for brunch, and at whatever time of day — they serve it until 4pm! The interior is spacious and convivial, if a little loud. If weather allows, the back garden is really where it’s at though! 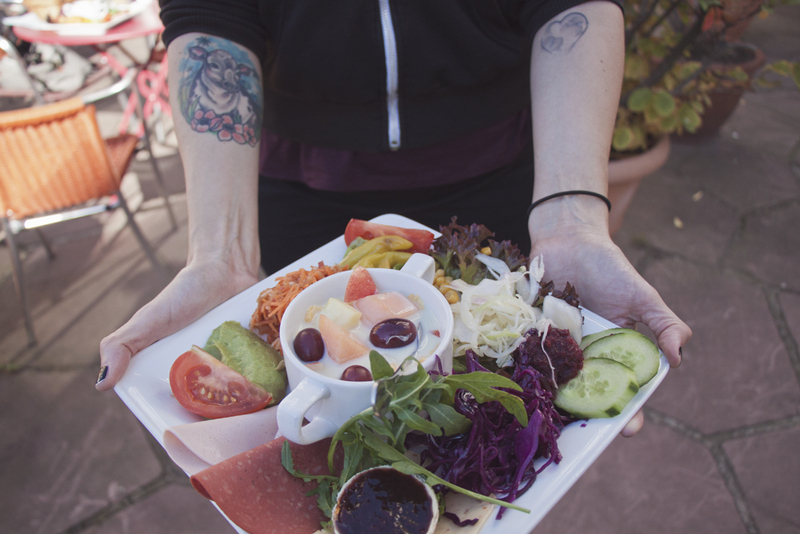 The vegan brunch plate includes vegan cheese and meat, pickles and krauts of all sorts, muesli and fruit, and a full basket of fresh bread rolls and jams. Really top notch! The right place to be for super healthy bowls and salads made with all sorts of grains, nuts, superfood, as well as for detox smoothies and green juices. Vevay is right up my street! Beware that not everything is vegan despite what it might look like. I had the udon noodles with fresh vegetables, enoki mushrooms, ginger and lemongrass soy sauce and it was great. They also do vegan brunch on Sundays. Good selection of vegan and raw vegan cake too. The last thing I was expecting in Frankfurt was to find vegan poutine. Oh, be still, my little Canuck heart! 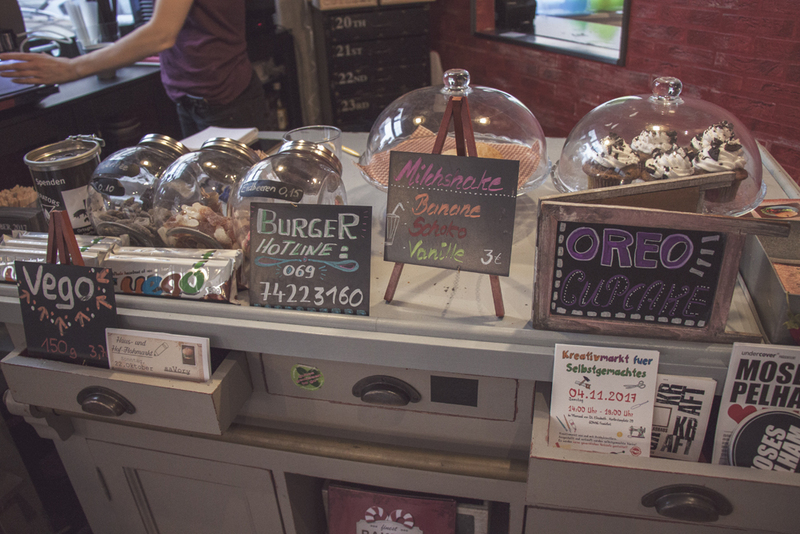 Located right in front of Central Station, and therefore the first food pitstop you must do, Frittenwerk is an omni fast food chain with a few vegan options. 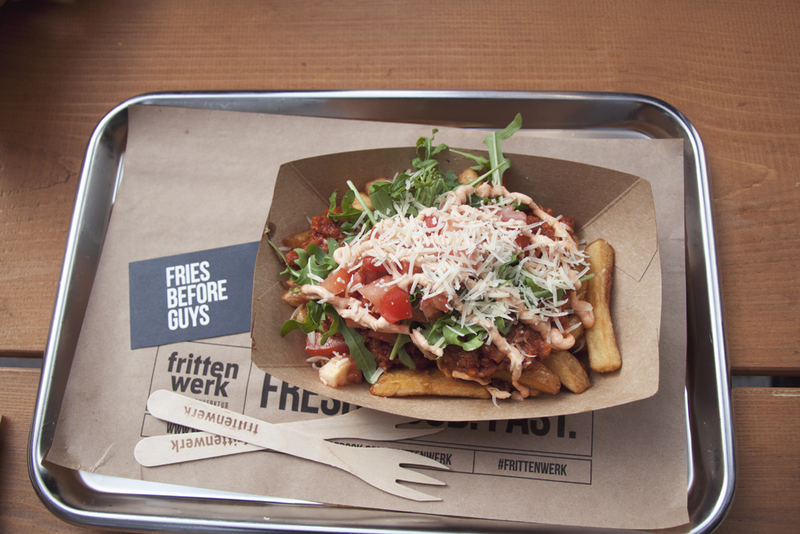 We had the Bolofritten, a large portion of fries with vegan bolognese, fresh arugula, tomatoes, spicy chili pesto and grated vegan cheese. Fries before guys? Any-freaking-time. 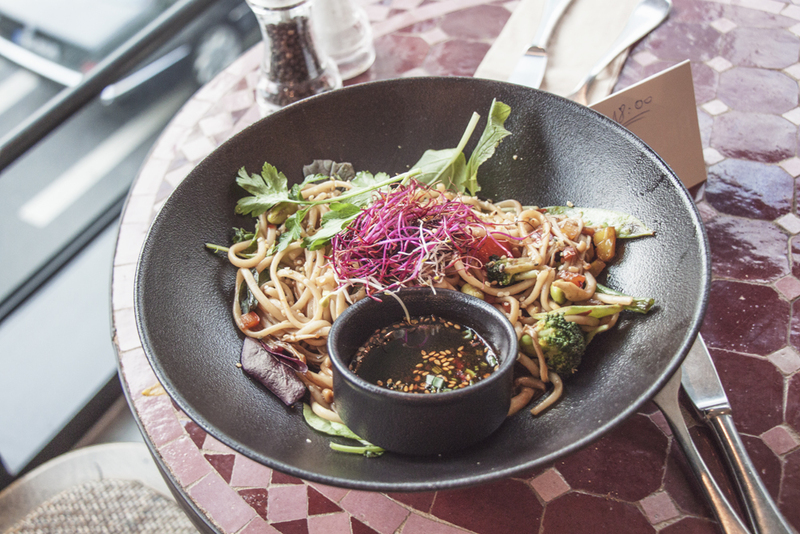 Eating vegan in Frankfurt seems to mean eating from around the world, and Aroydee is no exception. Serving very traditional Thai fares at not very traditional Thai prices, it’s another omni restaurant with several vegan options, such as curries and mock meat dishes. 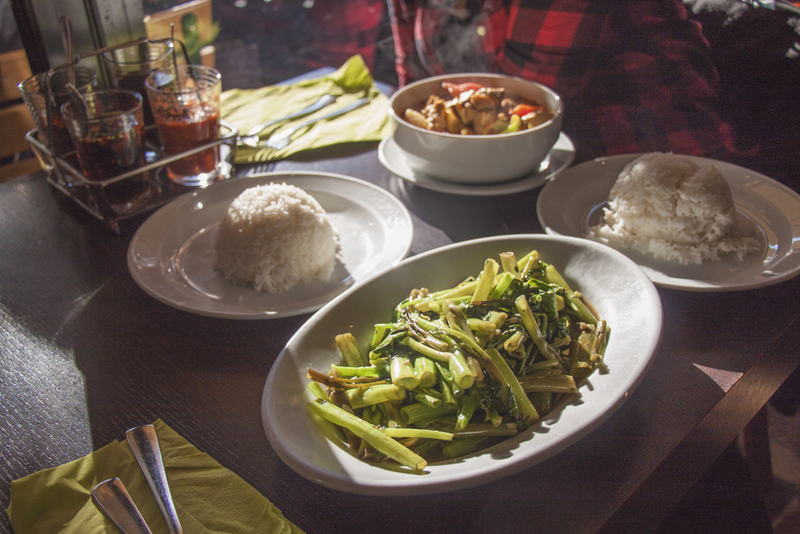 I was too excited to try anything but the morning glory when I saw it on the menu: a leafy green cooked with garlic and chili that I have never seen anywhere outside of Southeast Asia. Finding spicy food in Germany can be tricky, and Aroydee delivers on that front too! 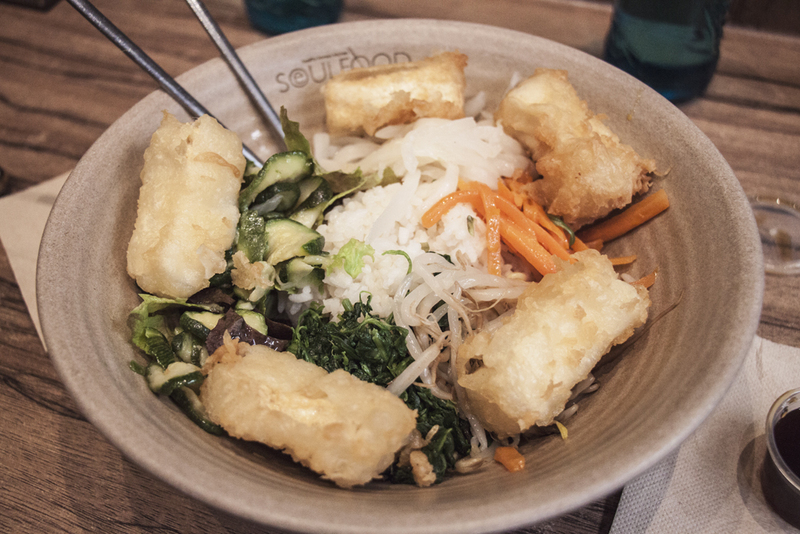 Seoulfood is a little Korean hole in the wall with a few vegan options that I found somewhat uninspired but still worthy of a mention because it is quick, healthy and affordable. Make your own bibimbap by choosing your grain, topping, and sauce (I recommend asking for extra sauce to compensate for the lack of flavor). There are also several sides and, if I’m not mistaken, all the vegan items are labeled. At the very least, the staff is very knowledgeable. I already knew the 25hours Hotel chain before visiting The Goldman and I was gagging to visiting one of them because of how quirky they are. 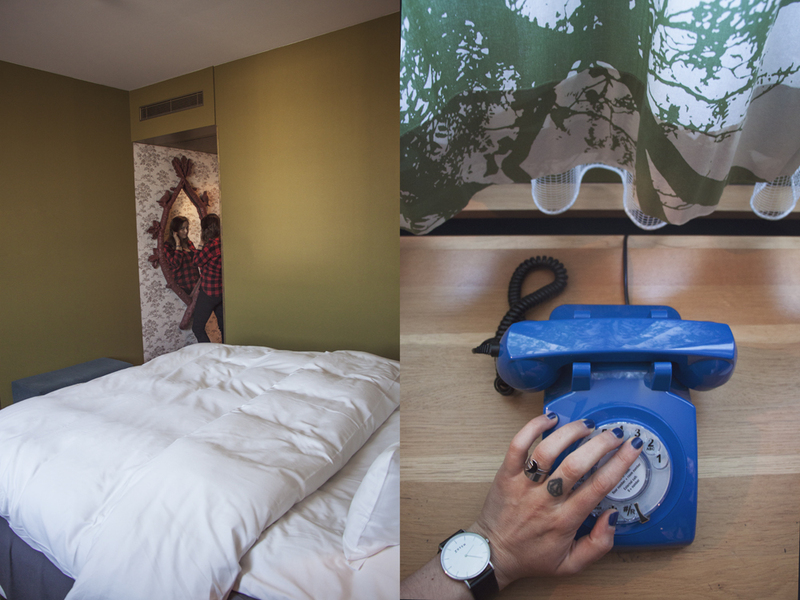 The Goldman is no exception and my #1 recommendation for a cozy and fun stay in Frankfurt. 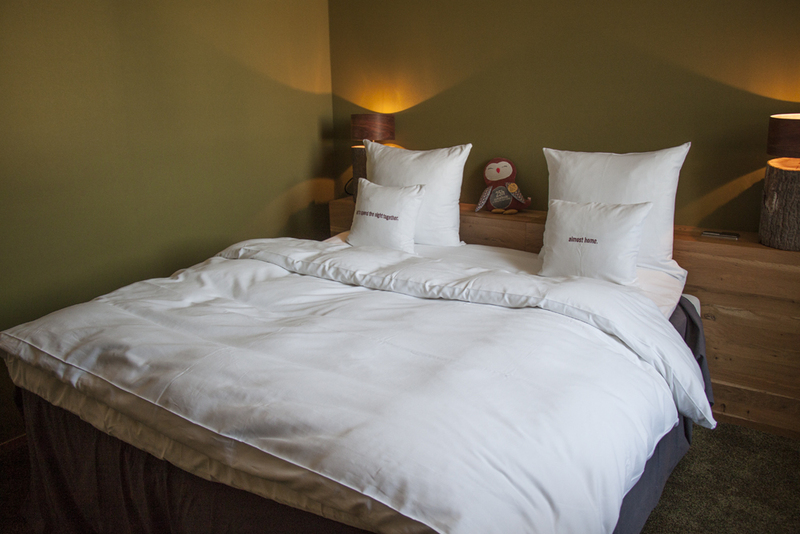 Located in the quiet yet trendy Ostend neighborhood, it is a short walk to the river. Everything about the 25hours The Goldman is perfectly curated and looks straight out of a Wes Anderson movie. 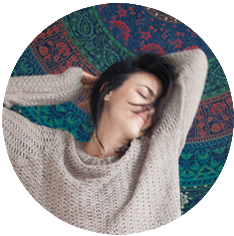 Retro touches meet comfort, with amazing beddings and heavenly-perfumed toiletries. The breakfast buffet is super vegan-friendly and the staff is helpful. The Goldman feels like it’s where the rockstars hang out. Heartfelt thanks to 25hours Hotel The Goldman. All opinions are my own. Ohhh fab good to know!! but the original option of falafel in pita bread is 100% vegan and 100% tasty!